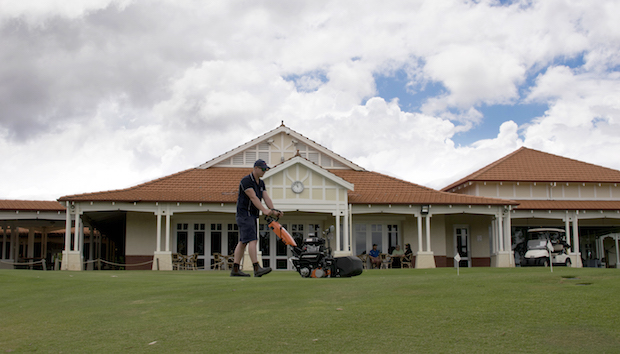 Mount Lawley Golf Club, located in Perth, Western Australia, has taken delivery of a fleet of machinery from renowned turf equipment manufacturer Jacobsen. Local dealer McIntosh & Son made the delivery. The Golf Club decided to invest in brand new machinery to improve the playing surface of the golf course for the members of the club. The machinery leased through Jacobsen included two Eclipse 322 ride – on greens mowers, two LF570 light fairway mowers, one LF1880 super – light fairway mower, one AR722 rotary mower, one GP400 greens mower and four Eclipse 2 walking greens mowers. Rohan Farrow, Interim Course Superintendent at Mount Lawley Golf Club commented on the new additions to the shed: “I carried out a lot of research before committing to Jacobsen machinery. I looked at our capital expenditure and took things into account, such as reliability, running costs and back-up support, before putting a case forward to the club. Jacobsen came out on top in all of the criteria and the demos that we had on the course, so it was an easy decision in the end. The Eclipse2 walking greens mower also features a unique password – protected LCD menu which allows users to set the frequency of clip, mow speed and other settings to customise the mower to course conditions. There is a range of models available in both Hybrid or Electric. Mike Foskett, Regional Sales Manager at Jacobsen commented on the new fleet at Mount Lawley, “This is a significant deal for us; Mount Lawley is a top-end club and has been using competitor equipment for a long time.